Designed to resemble a medieval fortress, the Arsenal was built between 1847 and 1851 as a munitions supply depot for New York State's National Guard. That original military use would be short-lived, as it would become part of Central Park. Over the years, the building had a number of interesting uses. It was a police precinct, a weather bureau, the first Museum of Natural History, and a makeshift zoo filled with animals on loan from the likes of circus founder P.T. Barnum. 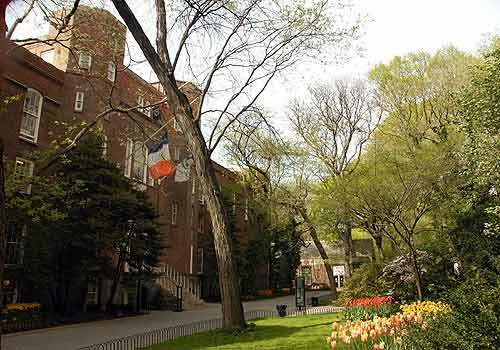 Today, it's home to the headquarters of NYC Parks and the Central Park Zoo. Although it didn't match the Park's more fanciful architecture, the Arsenal survived many calls for demolition over the years. Currently, visitors can see two significant pieces of New York City history inside. On the walls of the Arsenal's lobby, 1930s WPA murals depict historic scenes of the 19th century Park as well as soldiers in formation — a nod to the original purpose of the building itself. On the building's third floor visitors can view the "Greensward Plan" — the original Park plan, created by architects Frederick Law Olmsted and Calvert Vaux. The Board of Commissioners of Central Park chose this design on April 28, 1858. It is viewable by appointment only. The third floor is also home to the Arsenal Gallery, which is open 9:00 am to 5:00 pm, Mondays through Fridays and has free admission. Eight to ten exhibitions of fine arts and photography are mounted annually, with most focused on the natural environment, urban issues and parks history. In 2015, the Conservancy constructed a ramp at the Arsenal, making it easier for Park visitors to access both the Central Park Zoo and the historic Arsenal. Starting at the East 64th Street entrance, the ramp slopes 10 feet below the Fifth Avenue perimeter and offers better access for wheelchairs and strollers. In addition, we reconstructed the existing stairs into the Park and added new handrails, and improved the landscape inside the Park perimeter. The Conservancy is also reconstructed the perimeter pavement on Fifth Avenue from 60th to 65th Street.